On Sunday evening, a man opened fire on a concert in Las Vegas from the 32nd floor of the Mandalay Bay Hotel. At least 59 people were killed and another 527 injured before police found the man dead alongside 10 guns, with at least one automatic weapon. The attack is the deadliest mass shooting in US history. 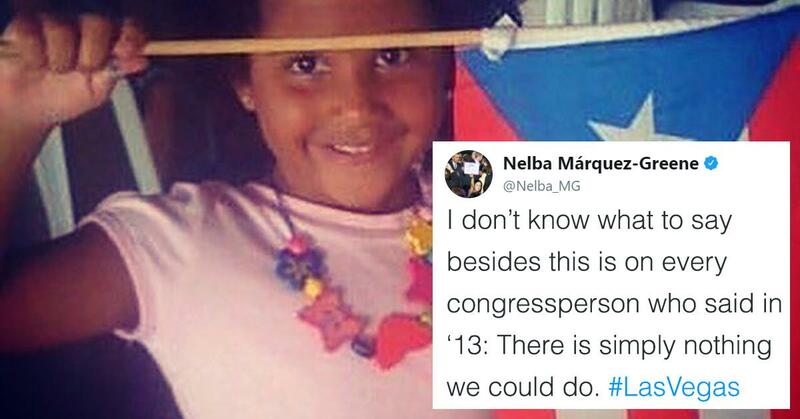 Nelba Márquez-Greene, whose 6-year-old daughter was killed when a gunman opened fire at the Sandy Hook Elementary School in Newtown, Connecticut, took to Twitter after the news emerged to accuse Congress of doing too little to prevent mass shootings. She also took the opportunity to reply to some comments. Anxiety, depression, PTSD- daily. Losing a loved one like this is a death sentence. We move forward for our son. I know so many mothers navigating this world of grief and trauma blindly because their kids died in urban centers& there is no sympathy. There is no such thing as being in the wrong place at the wrong time when a 6 y.o. gets shot. There are only cowardly congresspeople. Márquez-Greene finished by sharing a home video of her daughter. What do you think? Should Congress do more?